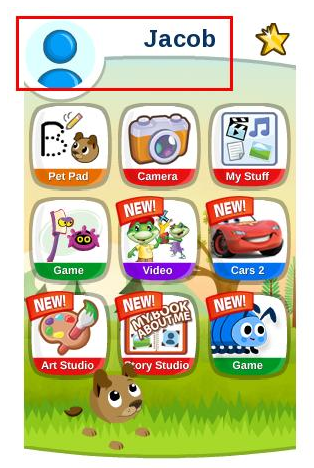 From the Home Screen, tap on the child’s name or picture at the top of the screen. This will bring up the “About Me” Screen. If you do not have a profile picture tap the icon with the blue figure in it or if you do have a profile picture, tap the picture, and this will bring up a popup showing the camera and the gallery. If you want to use an existing photo, tap the icon of the 3 photographs. This will launch the gallery where you can choose any picture shown. If you want to take a new photo, tap the icon of the camera. This will bring up the camera so you can take a photo. After you return to the edit profile screen, press the green checkmark to save this change.